How is an OLAF exam run? The Exams Office arrange invigilation and technical support. Students log into Blackboard using Respondus LockDown Browser and navigate to the exam and await further instructions. When the exam starts, students are instructed to turn over a printed slip to find a secret password that allows them to start the exam itself. Each question is displayed on a separate page. Students can move backwards and forwards through the exam using the next and previous buttons or the ‘Question Completion Status‘ bar. If students have any problems during the exam, the invigilators and computing officers assist. For an official OLAF exam, the password is changed after half an hour. This means that if a student leaves the room, they cannot access the test with the original password (they need to talk to the invigilator). If you are managing the test yourselves, e.g. for a resit or extraordinary sitting, you may wish to do this yourself. (Contact olaf.admin@ncl.ac.uk first if you need help setting up a copy of the exam). 1. Locate the test in the course. 2. Hover over the drop down menu to the right of the assignment name. Use the drop down arrow to the right of the test name to access the ‘Edit Settings‘ option. 3. 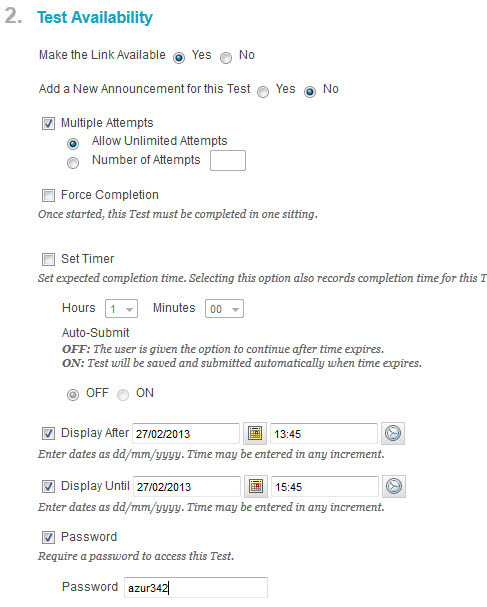 Scroll down to 2.Test Availability, the last item is the password (see screenshot below). Make the change and scroll down and click Submit.